As well as a contributing editor at The Nation, Christian is a professor at the School for International Training Graduate Institute. He holds a PhD in sociology and geography from the London School of Economics, and completed a series of post-doctoral fellowships at the City University of New York Graduate Center where he worked closely with Neil Smith and David Harvey. 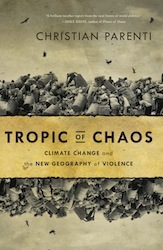 Christian’s latest book, Tropic of Chaos: Climate Change and the New Geography of Violence (Nation Books, 2011), explores how climate change is already causing violence as it interacts with the social legacies of economic neoliberalism and cold-war militarism. The book involved several years of travel and research in conflict zones of the Global South. His current research focuses on the environmental history of state involvement in American economic development, from the earliest days of the republic onward. Christian’s 2013 Antipode AAG Lecture will be followed by the first annual Antipode Groove Fest, which will be part reception (as usual) and part groovalicious opportunity for you to shake your groove thing to the sweet funky sounds being spun by DJ Mod and DJ Cornbread. In an effort to prefigure some radical democracy, if you want to bring a funky, soulful, or otherwise rad record (LP or 45), DJ Mod and DJ Cornbread will try to play a track from it. We all hope to see you all there! Christian Parenti to give the Antipode lecture at the AAG. This entry was posted on 9 April 2013 by Antipode Editorial Office in News and tagged Capitalism, catastrophic convergence, Christian Parenti, climate change, cold war, environmental history, geographical political economy, militarism, neoliberalism, poverty, the state, Tropic of Chaos, violence.